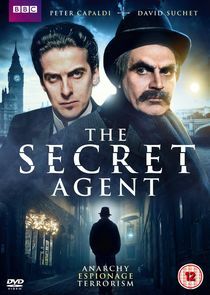 Starring David Suchet and Peter Capaldi, this powerful three-part BBC adaptation of Joseph Conrad's famous novel tells of an attempt by a triple agent to blow up the Greenwich Observatory in 1894, a time of unrest and anarchist violence throughout Europe. However it is the far-reaching effect this infamous conspiracy has upon the domestic life of the anti-hero, Adolf Verloc, that takes this compelling and complex tale beyond political intrigue to reveal a psychological drama of probing depth and vivid detail, in its incisive portrayal of human frailty. Forced against his will to commit a terrorist outrage, and become a political pawn, Verloc is unable to avoid involving his own wife, Winnie, and her handicapped brother Stevie, in an escalating and desperate struggle for survival in the merciless arena of political blackmail and treachery. The diverse worlds of Victorian London's embassies and fashionable aristocratic society, alongside the squalid criminal back streets of Soho, provide a smouldering background to the dark tragedy that will befall Verloc's family. Faced with an impossible moral dilemma this hapless victim of circumstance sees his life filled with mystery, danger and ultimately death.